Have You Heard of This Conservation Scientist’s #FitToFight Story To Save Our Forests? Krithi was only three years old when she spotted her first leopard and a tiger in the wild. By the age of 8, she was tagging along with her father, Dr. K. Ullas Karanth – one of India’s most renowned conservationists, to track tigers in the wild. 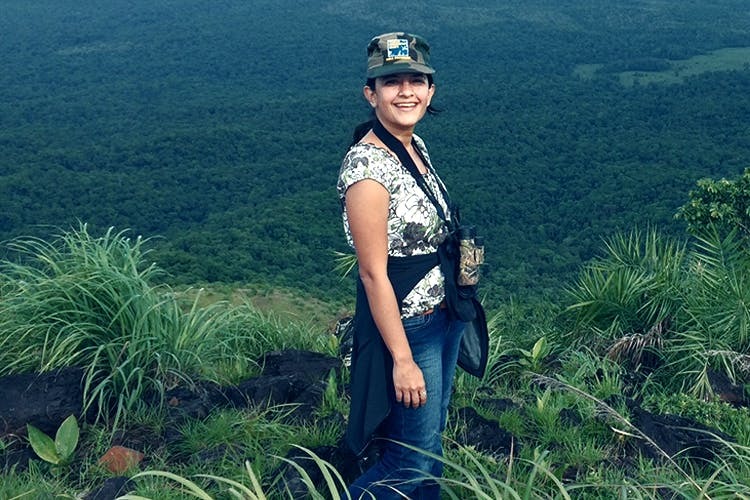 Very early on Krithi decided to dedicate her life to working towards conserving and preserving the natural habitat in which these animals thrive. Over the past 18 years, she’s worked on myriad projects including the impact of wildlife tourism, swept through the consequences of voluntary resettlement, researched land use change and understood the human-wildlife conflict. But growing up and becoming a scientist wasn’t easy. With project undertakings in far off places, to the challenge of being a women scientist, Krithi has faced and overcome hurdles all her life. Her main concern is that the government is not taking scientists and scientific studies into account when formulating policies around conservation. Does she ever feel disheartened? She tells us that in her profession, she fails almost 90 per cent of the times but those failures strengthen her resolve and it’s the remaining 10 per cent that keeps her fighting for conservation. But that is what makes things not-so-grim. More and more young people are raising their voices to better preserve the national parks and forests, and the government too is taking the importance of saving our forests more seriously. Read more of her story here. Here’s How Can You Help! Everyone can help in building a unified front when it comes to conservation. The best place to start is among your peers and communities by spreading awareness. Form a team or individually volunteer on projects undertaken by various local and country-wide bodies dedicated to conservation. Ever so often, there’s also a call for raising funds for research projects that we can help out with. What’s In Krithi’s Little Black Book? Favourite National park: Krithi loves going to Nagarhole or Rajiv Gandhi National Park and Bandipur National park and Wildlife Sanctuary. Favourite Place For Hiking: Krithi suggests visiting Kudremukha mountain range for all things hiking. For Stunning Landscape: Bhadra National Park tops her list as the place with the most stunning landscape but she also suggests visiting lesser known national parks for beautiful landscapes. Know Someone Who’s Fit To Fight? #FitToFight is an initiative by Reebok celebrating and valorising the extraordinary stories of every day Indian women. The stories will be evaluated by a prominent panel and will be felicitated by Kangana Ranaut herself at a grand awards night hosted at the end of this year. Do you know someone who has a remarkable story you think the world should know? Submit their story at fittofight.in or shoot an email at kangana.ranaut@reebok.in. This story is in partnership with Reebok.